Musings of a (mostly) Self-Taught Knitter: More graphics blather. I continue to be amazed at the steady flow of graphics jobs that are coming in. I remember how nervous I was to give this a try, and I also remember thinking no one would be interested in hiring me. I want to thank everyone who urged me to go for it. It's been wonderful so far!! Hopefully you're not getting sick of my graphics-show-and-tells, because I've got a couple more for you to see. Of course, you remember the wonderful knitting bag Michelle sent me in exchange for my graphics services? This was my first trade, and since she made the bag before I started the graphics, I was really scared that I wouldn't be able to put something together that was worthy of her sewing. It took us a lot of trial and error and a bunch of fiddling, but in the end it all clicked wonderfully! It's such a rush when it all comes together, it's like magic. So pop on over and take a look!! And thank you, Michelle, for all your patience and ideas. I had a wonderful time working with you!! Long time blog-pal and sock bag winner Sonya also contacted me about a banner and button for her blog. This one came together in no time flat. It's weird how sometimes they just click right from the beginning. Go on over and check out her new look too! 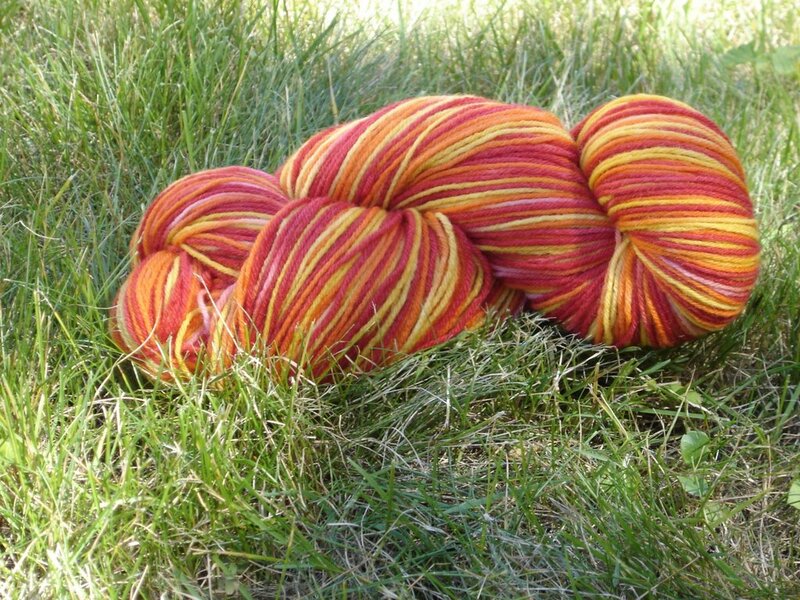 I was really happy with how this skein came out, and I think Kim really liked it too. Her dream colorway would be named "Autumn's Glory", so I tried to think of the colors the leaves turn in the fall. 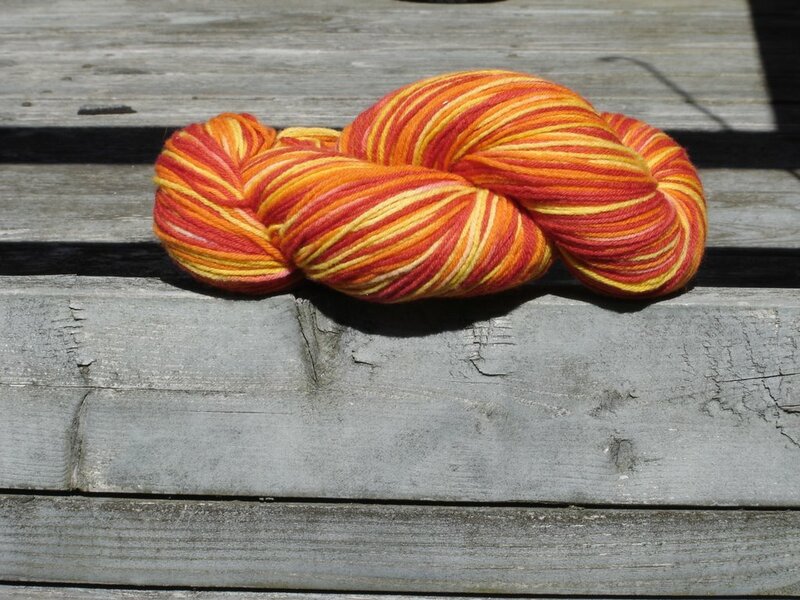 I'm sure I never would have experimented with these colors on my own, but in the end I really loved the colorway. I may have to try to re-create it on a skein for myself. Oh that yarn is pretty!! And hooray for your designs! Beautiful yarn colors, Karen! I love my banner and button. I still think the sheep are just the coolest. ;o) I'm glad you've got a steady flow of projects. You've got talent, girl! The yarn is really fabulous, and your latest banners and buttons are terrific!!!! Wanna swap some graphics for a sock bag? I love the new banners. Sonya's is so cute! Of course you're doing well, girl... cream always rises to the top! I knew that you would be a hit, with your OCD'ism working to your benefit!!!! Good job on the graphics! Karen, Glad to see that the graphics'gig is working for you. I check out the pages you worked on and they look great! Speaking of great, I LOVE the yarn you dyed. WOW!!! The yarn is so pretty. That's a project I have been wanting to do with my kids. Have to get the directions from you. Wow Karen your recent graphics work came out great, I especially like Michelle's. 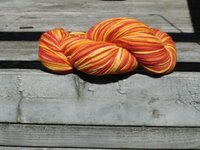 That yarn from your Dye-O-Rama partner is beautiful! Congratulations on having so much success with your graphics job, that's really amazing! And I so love the yarn you dyed, these colors are absolutely gorgeous! Wow, your Dye O rama was a huge success if you ask me. 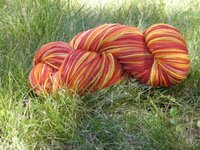 Autumns glory is aptly displayed in your yarn. Great news on your job front. I have to go and check the banners and buttons you've c reated recently. I so love my button! Great job on the new banners, Karen! I also love those Dye-o-rama colors..they're so warm and bright. Karen ~ I LOVE the cottage 46 knitter's banner and the Me and My Girl Productions! You are doing a great job! Sometimes I open mine up to look at the banner, because I love it so much!! Great job, you have a real nack for this!! I love your banners too! They are wonderful! To post or not to post . . .
AHHH, THAT'S MORE LIKE IT!! Too hot to blog . . .
Just a lemming after all . . . I've got to start blogging more!!!! So much yarn . . . so much inspiration.